Package smaller items in the red medical waste bags. 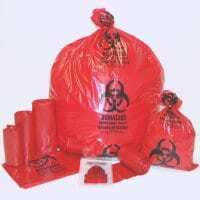 Larger items that do not fit in the red bags double bag in 40-60 mil plastic and seal shut. Proper notice by 2:00 p.m. on the day preceding delivery is required. Hauler must have a landfill permit from municipality.